The U.S. Energy Information Administration (EIA) recently published an excellent report on the projected cost of electricity generated by different technologies: coal, natural gas, nuclear, and various others, including renewables. Their Levelized Cost of Energy (LCOE) calculation combines upfront cost with recurring cost to estimate the average cost of power produced by these technologies. 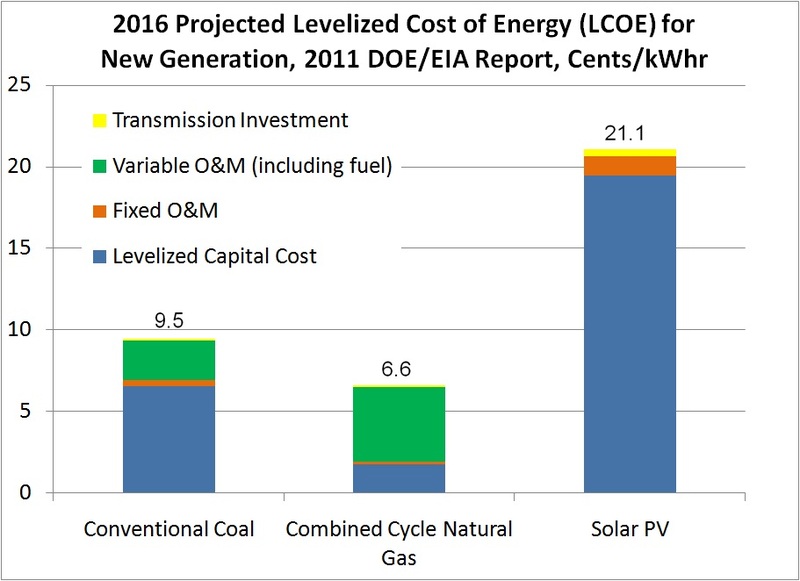 Here is the EIA cost datafor coal, natural gas, and solar PV. At first glance, it looks like PV could be competitive with coal or natural gas plants if the PV cost were to drop below 10 cents/kWh. But there is an important difference between PV and the traditional technologies which makes this simple cost comparison invalid. But first, take a look at the cost of electricity from a coal plant. The total cost is projected to be 9.5 cents/kWh per the EIA study. About 6.5 cents of this is capital cost and about 2.5 cents is the cost of the coal. Looking at the natural gas plant, one can see the capital cost is about 2 cents, and the fuel cost is about 4.5 cents. Solar has no fuel cost element but significant capital investment. But here is the rub. If you plan to power a city with PV, it is not sufficient to simply build a large PV array, because PV only produces power during the day. At night and during cloudy weather, a back-up power source is needed since there is no practical way to store the PV energy. So the city must also build a conventional coal or gas plant, which will sit idle on many sunny days. The real cost of the PV is not just its cost, but also the cost of the back-up plant. Coal and natural gas plants do not need back-up like PV does. So what is the real value of PV?It is principally the fuel savings which occur when the traditional plant can reduce output during sunny days. Or stated another way, PV is worth avoided fuel cost. The main point is that PV is not competing against the LCOE of coal or natural gas plants; it is competing against the variable operating cost of these plants, which is 2-4.5 cents. Here in Tucson, we use coal and the fuel avoidance value is less than 3 cents. For PV to actually be cost effective today, it would need to have an LCOE of about 3 cents. Since it is currently about 21 cents, it has a long way to go before it makes sense for the citizens of this city, despite industry propaganda and political pandering. But to further demonstrate how nonsensical this technology is, even if PV manufacturers drove the cost to $0/watt for PV panels, the cost of the aluminum mounting structure, copper wiring, labor, inverters, and maintenance result in a LCOE around 10 cents. So even with free PV panels, the total system is still three times too expensive to be viable on-grid . The economic case for grid-tied PV is indeed quite hopeless, and the sooner we stop the misguided subsidies the sooner we can focus on actually addressing our legitimate energy and environmental concerns. Installing grid-tied PV is not just a waste of time and money, but a waste of copper, aluminum, labor, land, and capital. We are neither ahead nor green. This wasteful activity is unsustainable, mining the materials used in these unnecessary systems is damaging the environment, and the entire endeavor is a burden on the economy. There is hardly a clearer case of special interest run amok, besides perhaps ethanol subsidies. PV is fantastic for people that live where there is no access to the electric grid, but it is wishful thinking to believe it can replace conventional generation methods or even be cost effective for on-grid application. Other renewables– geothermal and biomass– will likely become viable before PV because they do not require back-up power. But today, conservation is by far the best way to economically reduce pollution and CO2 emissions. EIA includes a 3 percentage point cost of capital increase for coal-fired plants without carbon capture and sequestration equipment to represent the difficulty in getting coal-fired plants permitted today. That 3 percentage point increase in the cost of capital for coal-fired plants makes the capital component larger than that of current coal-fired projects. Some folks will claim that costs from negative externalities were not factored in your analysis, and had you done so, the playing field would be much more level. However, the case is not so clear, as I discussed in my MasterResource articles “Coal: “Externalities” Can be Positive, Not Only Negative” and “55 Positive Externalities: Hail to Atmospheric CO2 Enrichment“. A very sensible and noteworthy article. Let me add broader context. On the subject of conservation, we should all understand that heavily subsidized, grid-tied solar and wind require a multitude of contrivances to compensate for their inherent unreliability and volatility. Here grid-tied should be understood to mean: the primary purpose of which is to feed the grid for consumption elsewhere, typically at some considerable distance. Such contrivances, especially the so-called “smart grid” through extensive, ill-advised and ill-conceived early implementations will provide the means for forced conservation, or rationing, initially through substantially increased electricity prices on a time-of-day basis (needed to fund the heavy subsidization and other contrivances referred to above, especially backup and balancing generation means not otherwise required). The most obvious early measure, smart meters, could also lead to forced conservation through more direct control of the uses of electricity (aka demand management). Undue reliance on wind and solar will also lead to forced conservation through lack of supply. Modern societies cannot withstand the absence of the adequate availability of economic and reliable electricity. That is not to say that intelligent, user-motivated conservation is not highly desirable. Just don’t bet on it, regardless of the high potential pay-off. The odds of it occurring in any significant way are small. This is a societal evolution issue which will take time to evolve properly. Let us not forget the important matter of cyber security. Our electric grids are already too dependent on computer and communications controls, which lack the needed level of security against unauthorized access and intervention. Too quickly increasing this dependence is folly. Returning to the subject of solar, there is a very good likelihood that extensive direct conversion of solar radiation to electricity will be possible at some distant future, perhaps as early is the second half of this century. This will require vastly improved conversion efficiencies and storage capabilities. This and other similar developments in energy sources, conversions and uses in the same time-frame are reasonable objectives. Timely realization of these requires the right focus in research and development starting now. As well, societal evolution will be necessary to be able to take best advantage of the needed new energy infrastructures. In the meantime, the best commercial/industrial practices and uses of our current energy extraction and conversion activities are needed to provide the optimal bridge to the needed future energy infrastructures. Intelligent use of what we have is the best answer to any present concerns, even climate change. I’ve done a number of cost studies of solar plants. Taking the reported construction costs of a solar plants, then figuring out the monthly payment at 6%. Then dividing cost per month by the kwhrs/mo produced by the rated max capacity (kw*.14*8760/12). I keep coming up with about 40 cents per kwhr. I did the same thing for a solar proposal for a large manufacturer where my friend is CFinOff at and came up with 40c/kwhr. I did this simply calculation for about 5 different locations and I always get 40c/kwhr, whether the project is large or small. That is true cost before subsidies. And of course, that doesn’t consider the capital expense of the non-intermittent backup source which must be considered as outlined above. We are constantly being told solar cell cost is coming down down down. Now here is a very interesting article. Is is even possible that solar has actually increased in cost? Seems impossible, but maybe so? I understand the externality argument. Let’s say for argument sake, CO2 cost our economy/environment $200/ton. Also assume we muster the political will to impose such a tax. The question is “will solar now make sense in the high carbon tax world?” I think the answer is “No, it will not”. I say this because there are a lot of direct and indirect energy inputs used to make and use on-grid PV. But beyond the energy inputs are the energy opportunity cost of the non-energy inputs. By this I mean, when we waste aluminum on PV frames and mounting structures, it crowds out better application, such as lightening vehicle or using more aluminum in transmission lines to reduce I2R losses. When both the direct, indirect, and energy opportunity cost of on-grid PV is calculated, I think one can demonstrate that on-grid PV is a net energy loser and therefore net CO2 producer. Conservation is the best move to reduce CO2 today. This is a complex economic argument. Baumol worte a Paper in 1981 about these Energy Subsidies. Here is something real crazy. This is a proposal for an industrial site. It’s a little complicate but a CPA explained it to me. My comments are in the reverse text. Now this plant was never constructed. The owner was skeptical that some of the tax credits would be rescinded and it turned out I believe he was correct. The bottom line was the plant would cost 1.3 million. He would get 1.9 million in state taxes avoidance and state grants (some of this was decreased). He would receive 700K in Federal grants and tax avoidance. The “math” of this project is simply IDIOTIC for us fellow American Taxpayers. We are teaching our children to be stupid. Now this guy should theoretically be the smartest businessman in the school district. Yet he doesn’t understand the oxymoron going on here. The taxpayers are going to benefit, yet the money is coming from state, local and fed grants, ie. the TAXPAYER!!!! I agree, I think the smart-grid push has all the earmarks of becoming a total disaster and forcing conservation in a most undesirable way. The thought of a cyber attack on a smart grid is also a concern. I wish utilities would start by simply broadcasting an AM signal with real-time price information. Then let the market evolve naturally. Comments? With that having been said, I have a question about your statement that a “Zero PV” panel would have a levelized cost around $0.10/kWh. What efficiency are you assuming as far as converting sunlight into electricity (had the PV been there)? (100% or ~30%) I’m guessing it’s ~30% because you quote an LCOE of $0.21/kWh earlier for the whole PV panel. Also, what value of discount rate are you using to calculate the LCOE of the aluminum, etc… ? And how long are you assuming that the PV panel would last? I think that this information needs to be communicated as wide as possible. I have nothing for or against solar; I just want to see the technologies compete on a level playing ground. I do have a problem with Germany’s feed-in tariffs for solar, and I think that some more information about those components of the PV panels that will not decrease with time could help inform policy makers. Most policy makers today are assuming that solar PV costs will decrease as the market size increases. It’s important to remind policy makers that the material costs will not follow a learning curve. (As well, land and installation labor probably won’t follow a learning curve.) In fact, materials, labor and land prices might increase (not decrease) with time if we build more solar and wind power plants because the price of electricity will increase if we force more feed-in tariffs. Thanks for the interesting article. I hope to see more details in a follow-up article or with a link to more information. The DOE uses a capacity factor of 25% which is twice the 12-12.8% used by the clean energy funds in New England. Using the more realistic capacity factor would double the DOE cost . In New England the cost of solar PV is about 65-75 cents per kWh. State subsidies are 35 to 55 c/kWh and the feds give a tax credit for 30% or about 20-25 c/kWh. In your calc, you sed 0.14 for the capacity factor and I think 0.19 is a better assumption. 19% (1650 hr/yr) is very doable in most of the SouthWest US. Also, the current installed cost for large PV systems is about $4/watt. You should be able to get a number closer to 20 cents/kWh with those assumptions. You’re exactly right; rate of return on investment is a much better metric. It avoided the apples-to-oranges comparison you see in the LCOE data. For the 10 cent LCOE with a zero Cost PV I assume every other system component cost remains the same; same mounting structure, same labor, same inverter, etc. I think most panels on the market have efficiencies between 10% & 20%. Of course a 100% efficient “free” panel will also have less mounting structure and labor cost, but that’s a different scenario. Yes, a “free” 100% efficient panel could be close to economic break even today. But alas,…those panels can only be found at the end of a rainbow. The higher efficiency panels tend to cost more per watt. I found some balance of system cost data on line, but I did not think it was very accurate. Better to call a local installer (or 2) and get a quote for a 5 kW system. They can tell you about the Panel Vs. BOS over the phone. Try a couple different states. And you’re right that the BOS equipment is more mature and the price is not coming down much or has even increased as raw materials increase in cost. Nice article. Good examples of how economics (the study of the allocation of scarce resources for alternative purposes) should guide energy choices. Some facts that the number crunchers ignore when extolling the virtues of wind or solar. 1. Utilities provide the value of the energy (kWh) supplied to the grid for a power plant. 2. Utilities then take the electricity back off of the grid power for the “house” loads. It is metered both ways separately. It gives them a bigger tax advantage. 3. Therefore the actual power delivered to the grid by any power station, coal, nuke, wind, water, solar, etc. is ALWAYS less than what you think it is. Typically 10 but could be as much as 20 percent less. Wind-turbines (each one – it is not just a generator on a pole) and/or solar farms are using more electricity 24 hrs per day when they are not running than the typical small business (pumps, motors, heaters, lights, aircraft beacons, computers, air conditioners for the equipment, backup power supplies, battery chargers, etc., etc.) You rarely get these numbers and even for the utility it is hard to find – it is called maintenance, overhead, or whatever to put in the best tax bracket. 4. My neighbor “guards” 25 wind-turbines near here. They are guarded 24 hours a day, 7 days a week 365+ per year. He gets $25.00/hr. That is 5 guards and a supervisor So, there is another approximately $100,000 (plus vacation, + medical, + sick pay, + etc.) per year to factor into these bird killer costs. Oh, there is also the vehicle costs for the guard traveling from wind turbine to wind turbine that need to be added in. And again they have these costs even when the wind is not blowing. These are the big things, there are many other “forgotten” expenses. They have been making power from coal for more than a century, they have a pretty good idea exactly how much it costs (total) and how much it sells for. I have read David Bergeron’s bio and he is very qualified to submit his analysis on the subject of the viability of solar PV for grid energy. Most of the world uses it in remote locations where they can’t afford the transmission lines and it’s used for things like running irrigation pumps. But at night they revert back to their basic midevil existence in a modern sense of oil lamps and what ever for heat. I would like to know where I could find an indepth analysis of the cost and performance of home solar systems up to date on such things as sizing, percent of production vers capacity in various areas of the country and time of day percentages on production. So far my search has led me mostly to pro solar sites that don’t give me the whole burrito worth, that is 60% beans and where’s the beef? PVWatts at the NREL site is good for performance data. They use the TMY2 database which has hourly data for different locations in the US. Although their default DC-AC derating factor of 0.77 seems low. I think 0.85 is better for state of the art inverters and panels. I don’t know where to find an indepth cost analysis. I call PV installers for the lastest pricing. I hope to be writing a paper on the cost topic in the Spring. Great article. Most people do not understand that the true price of PV should include supplemental back-up power from a conventional plant. Widely distributed PV systems could alleviate extreme intermittency that can occur with every passing cloud but will still depend on load-following fossil fuel generation as a supplement at night. This is a tricky issue because if an individual is willing to pay the price to put a PV system on his roof you would think that he has the right to grid interconnect it, but as more PV systems go up all utility subscribers will have to pay the price to provide back-up generation to account for intermittency caused by the PV systems, and as the amount of PV systems increases the back-up power will have to be increasingly responsive. Energy storage on a distributed scale doesn’t seem as though it will ever be practical and PV generation beyond 20% of overall grid power would be very unstable. Wind on the other hand, while still requiring back-up power, is a much more predictable intermittent source. Texas has its own grid system which utilizes above 20% wind energy on especially windy days. Monitoring of anemometer sensors around the perimeter of wind farms allow back-up fossil-fuel generators to easily ramp up and ramp down according to the incoming windspeed. Also, wind turbines have inertia so when intermittency occurs the rate of decrease in power generation is much more gradual than a PV panel which can instantaneously lose 80% of produced power under cloud cover. These things make providing back-up power to wind much more practical. It will be interesting to see if grid-connected PV is here to stay or if it is just a fad that will quickly disappear with the advent of next generation nuclear reactors which should see implementation in a decade or two. Well said, but everyone needs to understand that adding Solar on their property is an purchase that could raise the actual value of their residence if / when they decide to sell. With the environment the way it is going we are not able to dismiss any system that supplies zero cost electricity at no cost to both the buyer and more significantly the environment! Darron, Solar PV is very expensive power and therefore non-sustainable, so it is not useful for addressing environmental issues. It is not “Zero” cost, just the opposite, it is very high cost. Carbon trades for about $10/ton in the EU and saving CO2 with solar cost $140/ton, not including the indirect effects of misusing our resources to make PV panels when we could have been increasing the insulation in homes or making cars get better mileage. PV is truly a false hope and placebo for the common man.